Tiffin Area Pax Christi | If you want peace, work for justice. Pax Christi member Jim Bailey’s letter to the editor was published in the Review-Times on Nov. 14. His analysis of the healthcare issue is outstanding. Keep this letter for reference as the new administration attempts to “reform” the system. Thanks, Jim! The Affordable Care Act (aka,”Obamacare”) received much undeserved negative attention in the recent presidential campaign. While “Obamacare” is imperfect, it is a significant improvement on what America had before. This is true because of the millions of people who have gained health care coverage and because there are less excuses for insurance companies to deny coverage. For example a pre-existing condition can no longer be used as a reason to deny coverage. Despite these improvements there are still significant life threatening deficiencies in our health care system. Every other rich country has made the moral decision to guarantee health care to every person. We ,in effect, have made the immoral decision not to guarantee health care to every person. Beside guaranteeing universal coverage the other factor that distinguishes the health care systems of all other rich countries from that of America is that their health insurance is not for profit. America stands alone among developed countries by financing health care primarily through profit seeking health insurance companies. Other rich countries do not spend their health care insurance dollars on advertising, profits for stock holders or paying people to deny coverage. Instead, their health insurance focuses on providing health care to all their people. In America we get less health care for more money. The World Health Organization ranks the U.S. system 37th in general effectiveness. Some outcomes measured are life expectancy, infant mortality, survivability from potentially fatal diseases and affordability. Canada (the government is the insurer, providers are mostly private, it is like our Medicare system) ranks 30th. The United Kingdom (socialism, government owns and controls, like our Veteran’s system) ranks 18th. France (insurance is non-profit, providers are private entities, government regulated) is number #1. Japan’s system (#10) is similar to that of France. Our health care system is by far the most expensive in the world. Our cost per capita is about $8,200. The average for most other developed countries is only about $3,300! In terms of percentage of GDP, the U.S. spends 17.1% for health care. France is second at 11.6%. America should have the wisdom to learn from the experience of other countries. President Eisenhower borrowed our highway system from Germany. Why not have the good sense to borrow from the health care systems of countries such as France and Japan? Their systems are not socialistic. Health care providers are mostly private but the privately owned insurance pools are not for profit. Compared to the U.S., they provide more for less. “Obamacare” took some important steps in the right direction but most of us still get “less for more” and some get no health care at all. Americans continue to die because they can’t afford health care. This situation is morally wrong. We could and should do better. Now, as “Obamacare” is being reconsidered, is the time to for our country to take a momentous step forward by guaranteeing health care to every American!!! More news from the peace booth we’re sharing with Project Peace. Wow! I can hardly believe the crowds of children and adults who come to our peace booths this year. On this day we had 232 children and adults combined. For the 4 days we’ve had 704 visitors so far. All this visiting surely takes a lot of energy! Hail and hardy we must be! And though the tattoos are running out, the headbands and “Pops for Peace” are going strong. it’s the HOPE our booths on peacemaking inspire within the adults. A couple from Knoxville, Tennessee underlined with their knowledge and their support all our efforts toward eventually eliminating WAR. I am so thankful for all the support received. We’re co-hosting the Project Peace booth at the fair this week. Here’s a great story from one of the volunteers! Upon inviting a grandmother and her 17 yr. old granddaughter to explore the Peace Booth, I found a captivating story unfold. Grandmother, “Carolyn Faith,” had been the Host Family to 17 yr. old “Robie’s” father, some 20 years ago from the Netherlands. He was not only incorporated into the “Faith” family for that school but became a son of their heart for life. Soon after, they traveled to the Netherlands to attend his wedding. When Robie was born, Carolyn became their granddaughter. History repeats itself. Robie visited the family with her parents at age 8 and became their exchange student in high school, immersing herself into a new culture and language. Pax Christi will be helping Project Peace with their booth at the Seneca County Fair at the end of July. We’re excited to welcome the efforts of Project Peace’s new intern! My name is Scott Williams, and I am currently working as an intern for Sister Paulette and Project Peace. The majority of my duties here involve social media and creative assignments, but today, I wanted to share with you one of Project Peace’s bigger projects that I have been tackling lately. 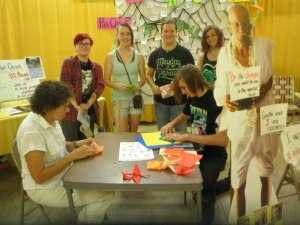 Each year, Project Peace holds a booth at the Seneca County Fair, side-by-side with the Pax Christi group, another peaceful advocate here at the Sisters of St. Francis. We were pleased to help staff this booth! Thanks, Sr. Paulette, for all your efforts to reach the children of our community! This is the column she wrote for the Advertiser-Tribune. Enjoy! It seems almost impossible, but it’s true! The Seneca County Fair with all its amazing preparations and hype to lure people to “come and see”—is all in the past now. What loud applause we need to extend to the many workers and planners of this well -organized week!